By the time we climbed the third platform, darkness prevailed. I couldn’t see anything in this moonless night, so thought of myself as an owl flying towards prey. In this case, the prey was a distant glow coming from a flashlight held by the attendant at the far end of the line. A brochure from ZipQuest promised, “Take a short drive to a big adventure.” For me, the adventure required a long drive; one from St. Augustine, Florida up Interstate 95 to North Carolina. But ZipQuest delivered on adventure. My 23-year-old daughter and I were headed to the Outer Banks of North Carolina, and decided to split our long journey over two days and spend the night in Fayetteville, North Carolina. I’ve previously let loose my inner child, feeling jungle breezes whizzing past my body while zip-lining through a rainforest. But Laura had never experienced the Tarzan-like adventure of flying while clipped to a steel line. So after dinner, we drove to Zip-Quest, ranked as one of the ten great ziplines in the United States by USA Today. 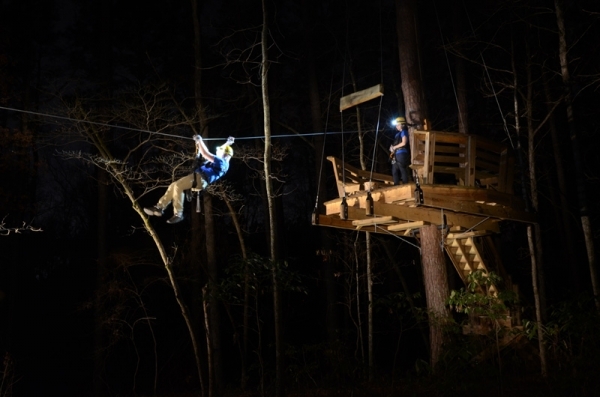 I was intrigued by the scary fear factor of soaring in a night forest. We only needed to arrive about 10 minutes early for our 8:15 reservation, since ZipQuest very efficiently processes wavier and release forms via email. We met our guides and shimmied into our harnesses and donned hard helmets which had headlights on the front. Safety first, the group was given a lesson and then each person took a test run on a very short hipline, barely hovering above ground. We learned how to slow down, stop and reverse direction and pull ourselves in- should we get stuck somewhere before the end of a run. 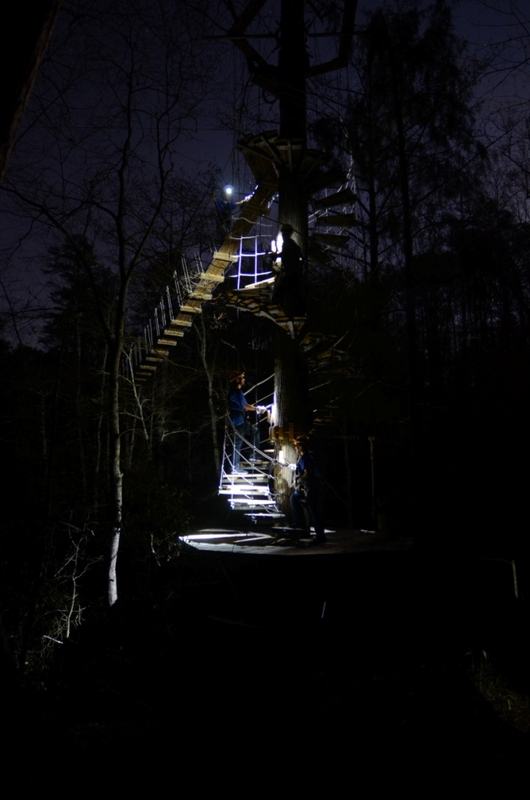 As the sun was setting, the group walked down the trail and climbed up a platform for our first treetop adventure. Laura, like the other newbies, was getting the hang of the sport: the clipping in and out of the cable. When she completed her first aerial zoom, I saw a smile creep over her face. The second span ran much longer and faster. Whoa! We were airborne like eagles. At this point, darkness had descended. I couldn’t see anything in front of me, so conjured myself into a wise owl and headed toward that glow at the far end of the line. Whew, I made it. However, when I watched Laura swooping in behind me, she looked more like Batgirl; confident and on a mission. To be honest, I personally think ziplinng in the day is more fun. For me, the joy is being connected to nature and the trees. I love perching in treetops like a bird and peering below. At night, you miss that perspective and beauty, but you do gain the challenge of releasing your comfort zone, and shall I say, spreading your wings in the dark. 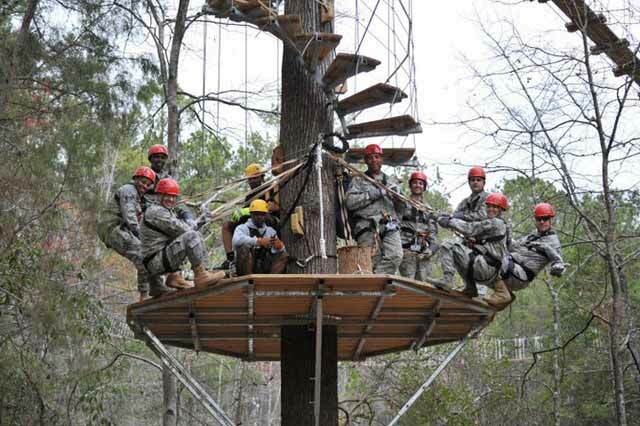 Facilities at Zip Quest offer fantastic floating staircases and platforms anchored to centuries-old trees. 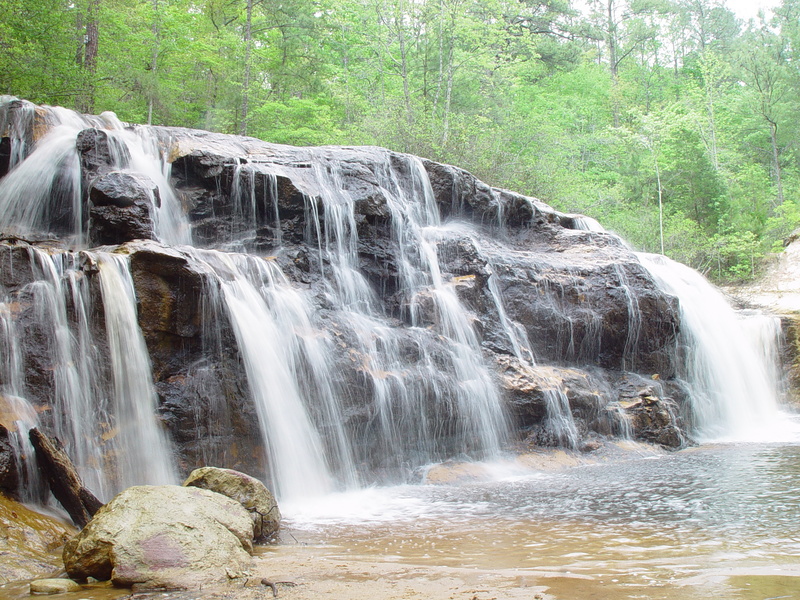 They also include a few awesome suspension bridges that span the Sandhills’ only major waterfall- Carver Falls. We wobbled and bounced our way across these. Laura claimed she was happy it was pitch black because she couldn’t tell how high we were off the ground. To each his own. The group could clearly hear the roar of the falls, as we neared, but couldn’t appreciate the scenic wonder. Eventually, we pointed our helmet lights downward and our guides faintly lit the area with their flashlights. I would go back during the day just to revel in the beauty of this spot and North Carolina’s famous loblolly pines. But I guess I’ll just have to go to Carolina in my mind (Yes, I’m a James Taylor fan). 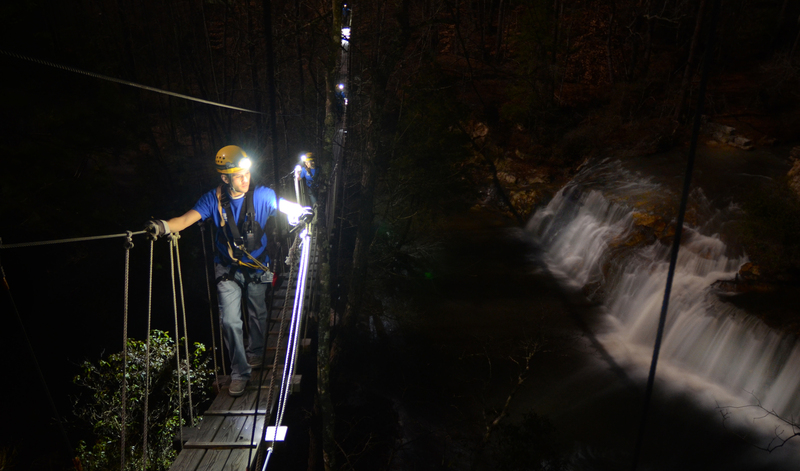 Plan to spend about two and a half hours maneuvering your way across ZipQuest’s eight ziplines and skybridges. Wear closed toed shoes and pants or Bermuda length shorts, as the harness runs across your thighs. Of course, no zipping if you are pregnant or under the influence of alcohol or drugs. Weight requirements run from 70 to 250 pounds. Disclosure: Many thanks to ZipQuest for hosting the adventure.